In setups with digital high speed modules and instruments, the clock distribution is always challenging as some parts require a full-clock, others a half-clock, and some even a lower fraction clock signal. Our latest release, the SHF 78121 A is designed to facilitate such a complex test set ups requiring a range of clock signals. 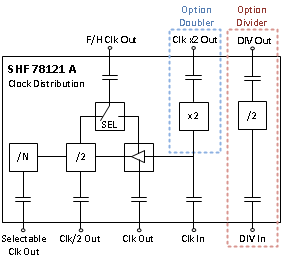 The SHF 78121 A is a bench top style broad band clock signal distribution instrument. With an external clock input, it delivers a copy of the input clock, a 1/2 clock with minimal added jitter, as well as clock signals at various division values selectable through front panel software control. The frequency range of 3 to 56 GHz covers a majority of applications in high speed data and optical transmission test and measurement application. Optionally, a clock output of double the input speed is also available (this even works up to 64 GHz). The data sheet can be found here.